Having discovered that Manchester schools are now, at last, incorporating the wonderful story of how a Manchester family, the Pankhursts, led the campaign to gain women the vote, into their curriculum, we are hoping that they book a Pankhurst tour for older pupils with New Manchester Walks. This is the expert tour (with many public dates; see website), lovingly created out of copious research by Ed Glinert. For instance, on this tour we won’t tell you that the infamous 1905 rally disrupted by the Suffragettes at the Free Trade Hall took place under a Liberal Government; that’s because there was a Tory government at the time. Indeed the prime minister was a local MP (industrial east Manchester). Yes, Manchester with a Tory MP and the prime minister, no less. Nowadays it’s illegal to vote Tory in Manchester. Below is Ed Glinert’s article about the centenary anniversary of the royal assent being granted to a bill to allow women to vote. We at New Manchester Walks have been singularly unimpressed with the poor standard of articles in the local and national press about this most important topic. Even the Sunday Telegraph managed to bore its readers with their anodyne piece. And as for the Manchester media…they all missed the key points, the most interesting aspects, and the local angle. So now Ed Glinert, expert Manchester tour guide, former Private Eye staffer, and compiler of the forthcoming Manchester Encyclopaedia, has stepped in to offer a vigorous alternative, revealing the extraordinary Manchester connections, linked in with our regular tours on the subject. Celebrations have been taking place in 2018 to mark the centenary of the royal assent given to a bill allowing women to vote in Parliamentary elections in Britain. Yet it was only for some women. Women continued to be discriminated against, for when it came to the vote they weren’t being given the same rights as men. How did it get to that stage and what was Manchester’s involvement? We could go back as far as Peterloo on 16 August 1819, when Mancunians demonstrating for the right of anyone to vote were butchered by the military. Now that’s an anniversary which will be marked strongly in Manchester. For this story let’s just return to the first few years of the 20th century when a new era saw the campaign to secure women the vote stepped up. But why didn’t women have the vote. Power veered regularly from Conservative to Liberal and back again in those days. In July 1902 Arthur Balfour, Tory MP for East Manchester (yes, you read that right; a Tory MP in Manchester) became prime minister. His party’s view on the issue was that women didn’t need the vote as the household was already represented by the men folk. Why would women need a separate vote? Nearly four years later the Liberals won a landslide at the general election. Their view was that if women could vote they would vote Conservative and the Liberals would be out of power. In contrast the nascent Labour Party, some twenty years before they came to power, was broadly in favour. Broadly. Remarkably in the first Labour government of 1924 there was one member of the cabinet, Chancellor Philip Snowden, who was against women having the vote. In 1903 members of the Independent Labour Party, a left-wing pressure group allied to the main and recently-born mainstream Labour Party, arrived at the Pankhursts’ shop on King Street with a request for young Sylvia Pankhurst. an aspiring and talented artist. (See an example of her work below). You didn’t know there was a Pankhurst shop on King Street? That’s one of the first stops on our walk. Would Sylvia like to come to Hightown, two miles north of the city centre, where the Independent Labour Party were building a public hall? It was to be called the Pankhurst Hall after Sylvia’s late father, Richard, a major campaigner for women’s rights, and they wanted Sylvia to supply the designs and decorations. What an honour! Sylvia Pankhurst, then 21, had studied at the Manchester College of Art (where L. S. Lowry was an almost contemporaneous pupil). She would go on to win a scholarship to the Royal College of Art in London. She happily accepted the invitation and began work. Casually mentioning to one of the men how she was looking forward to returning to the hall once it had opened, she was informed, to her horror, that women weren’t going to be allowed in. Sylvia returned home to Nelson Street, Chorlton-on-Medlock (now the Pankhurst Centre), and revealed the news to an astonished mother, Emmeline, and her sisters, Adela and Christabel. Their response was to form the Women’s Social and Political Union (the WSPU) in October 1903. Its motto: “Deeds, not Words”; its purpose: to step up the campaign, to energise what had been a polite pressure group into a vigorous and visible body. The Daily Mail newspaper mocked the women suffrage supporters. It called them “suffragettes”, a term they then began to use gladly for themselves. The first major move by that body came two years later, on 13 October 1905, when the Liberal Party, expecting to win the forthcoming general election, held a rally in Manchester’s Free Trade Hall. The suffragettes went along with the express aim of disrupting it. The two leaders that night – Christabel Pankhurst (representing the middle class supporters) and Annie Kenney (for the working class) – were jailed in Strangeways Prison. The local Liberal Parliamentary candidate turned up at the prison offering to pay the women’s fines so that they could be quickly released. The philanthropic politician was none other than Winston Churchill, MP for Oldham, who had recently crossed the floor from the Conservative benches. But was this really a welcome move or just a cynical one? Surely if the women agreed to his offer he could champion himself as being in control of them …? They politely rejected his advance. Churchill lovers should note at this point that the great man remained a resolute opponent of female franchise. The sight of a woman in the House of Commons once caused him to remark “it was as embarrassing as if she had caught me naked in my bath”. The suffragettes knew that if the campaign to secure women the vote was to succeed it should be taken to London where direct action would achieve more publicity. This followed in more dramatic ways than even they could have originally envisaged. Sylvia Pankhurst herself later explained in her memoirs how things exploded. The outbreak of the Great War in August 1914 changed everything. Emmeline Pankhurst and her favourite daughter, Christabel, took a pro-war line. They shelved suffragette activity to fight the war. The WSPU began negotiating with the Liberal government. 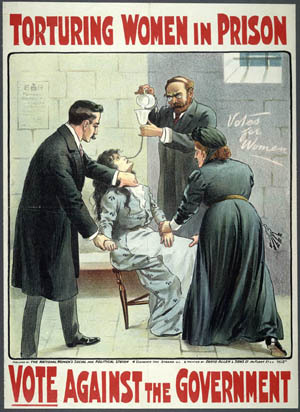 On 10 August, the government announced it was releasing all suffragettes from prison. In return, the WSPU agreed to end their militant activities and help the war effort. Emmeline Pankhurst announced that all militants had to “fight for their country as they fought for the vote”. They received a £2,000 grant from the government – some might call it a pay-off, or worse – and organised a demonstration in London at which members carried banners with such slogans as: “We Demand the Right to Serve”, “For Men Must Fight and Women Must work”, and the absurdist “Let None Be the Kaiser’s Cat’s Paws”. Sylvia Pankhurst was horrified. A pacifist, she believed the war to be an imperialist affair that had to be opposed. The campaign to gain women the vote had to be continued. But Emmeline Pankhurst and Co’s help was rewarded with legislation to give women the vote, processed towards the end of the war. Some women had supported the war effort so some women were rewarded with the vote, the decision now being celebrated on its centenary in February 2018. At the December 1918 so-called “Khaki General Election” Christabel Pankhurst stood for a new political group, the Women’s Party, in Smethwick near Birmingham, but lost to Labour. She then quit politics, emigrated to California and got religion. Only one woman was elected to Parliament, the staunch suffragette Constance Gore-Booth, better known then as Countess Markievicz, as Sinn Fein member for Dublin St Patrick’s and predictably refused to take up her seat. But for Sylvia Pankhurst and her many supporters the fight continued until women were treated equally with men. They would have to wait ten years for the ultimate government measure – from the Tories.